That’s pretty much what I stick to when I’m home making food for myself. If I’m out to eat or at someone’s house, I’m much more flexible, but always avoid wheat and dairy because of the acute effects they have on me (i.e. I become a runny-nosed, phlegm-hacking zombie monster). Here are two example menus from my stomach’s archives—the first one being a “high fruit” day, the second being a sushi-feast day—with vitamin and mineral totals beneath each food list. My food intake is usually closer to the first one, with fat kept relatively low (10 – 20% of calories). High fruit day: Lots of strawberries for breakfast (I do mean lots); mango-spinach-egg-coconut water smoothie for lunch; giant salad plus oysters for dinner; blueberries for dessert. Sushi-feast day: Papaya for breakfast, salad with eggs for lunch, mega sashimi and miso soup for dinner. Although I believe at least some portion of raw foods are valuable in a person’s diet (not just fruits and vegetables, but also raw fats and lacto-fermented “living” foods), from a scientific standpoint, I have no reason to believe a 100% raw diet is superior to a well-planned mixed cooked/raw diet. I choose raw for myself based on personal experience and relentless self-guinea-pigging: compared to a cooked diet based on the same foods, I just feel a heck of a lot better on the raw end of the spectrum—needing less sleep, having a stronger desire to move and exercise, brighter eyes, better immunity, a greater ratio of happy-happy-joy-joy moods to bluer ones, and other little perks that make the social hassles worth it. I have no scientific explanation for this, though it’s something I’d like to eventually explore on a more objective level. I’m also kind of accident prone, so it’s probably for the best that I’m not near hot stovetops. I guess this doesn’t really qualify as diet, but a few people have asked and I don’t know where else to stick it. I engage in regular strength training and bodyweight exercises—usually at kiddie playgrounds, where I end up hijacking the monkeybars to do pull-ups. I also do yoga, some gymnastics, and (weather and geography permitting) outdoorsy things like hiking and mountain biking. I favor high intensity interval training (HIIT) over sustained cardio like running, but I do trail run sometimes during the summer. I also walk or bike at least a few miles every day because I don’t have a car. I figure I ought to be in good fighting shape in case PETA ever tracks down my address. This is a great blog. I really enjoy your rational approach to raw. i’ve known about Raw Foods for 5 years now but Ive been too scared to go 100%….. i feel like there isn’t enough scientific information to prove it works, or to know about the long term effects….. but so many people swear it works!! Thank you Laura! I hear you about the lack of science. I don’t think blind faith and health mesh too well—like you, I want to see evidence of things working before I dive in. Unfortunately, raw is still relatively “fringe” as far as diets and nutrition go, and the existent science is pretty sparse (not to mention, the studies that HAVE been done on raw are so misreported by mainstream media… but that’s a topic for another day). Thanks for reading. I do love to research, and I hope the things I find can help other folks on the raw path. you are the FIRST person i have come across who is not trying to shov raw down my throat. yes, I eat raw foods, but a few times a month I might eat a cooked potato…and I don’t feel like i’ve found anywhere online where I can be honest about that. its soo black and white in the raw world and i think it is unhealthy. since going raw, i havent lost any weight…and i need to loose a good 10 or 15 pounds (and i’d still not be at my happiest weight). anyway, I’m nervous with this. i dont’ feel like there is anyone to talk to who isn’t going to tell me how bad i am for not following the diet that they follow or for eating/not eating fats or fruits. and i just want to be healthy too! i worry that ill never lose the weight eating all these fruits because i was low carb for years. im so thankful for you and this blog! I completely agree about the black/white attitude in so much of the raw world—there really aren’t any places that allow a safe and honest discussion about what works and what doesn’t. So much censorship, so many rules, so much dogma. It’s a shame this diet has to bear the shackles of zealotry—it would reach so many more people if we stopped treating raw like a religion. Stressing out and being nutritionally fanatical will harm you far more than a baked potato. I’ve settled into something like “low fat raw with fish” as well, and I think it’s a very viable diet. Let me know how it’s working out for you. I’ll be writing some posts in the future about weight loss that may be able to help you, so stay tuned 🙂 It may be frustrating, but sometimes your body has its own agenda when you switch to this eating style… I’ve seen folks go for months without losing an ounce, and then all of a sudden, without changing a thing, 20 pounds fall off. The body is so weird and amazing. You’re words of wisdom are refreshing and insightful. I’ve been thinking of going raw for some years now, but I’m afraid to give up my “Starbucks” and warm comfort foods. I feel that I eat healthy for the most part, but know I’d have a lot more energy and lose weight if I went raw. I’ll keep reading your blog and articles and maybe I’ll gather enough courage to start this diet some day. Thank you for the great info. Thanks for reading, Sue. Even a small increase in your raw food intake is beneficial, so don’t give up just because you can’t go 100%! As for the comfort foods, those can be tough to part with, especially in the winter or in cool climates. You may have an easier time starting a raw (or high-raw) diet when the weather warms up. I’m now gradually working my way through all your posts. I did want to say one thing about something in this post–regarding powdered raw foods. I think some of them do have a legitimate place in the raw food world–actually, just a legitimate place in the herbal/medicinal world regardless of raw. 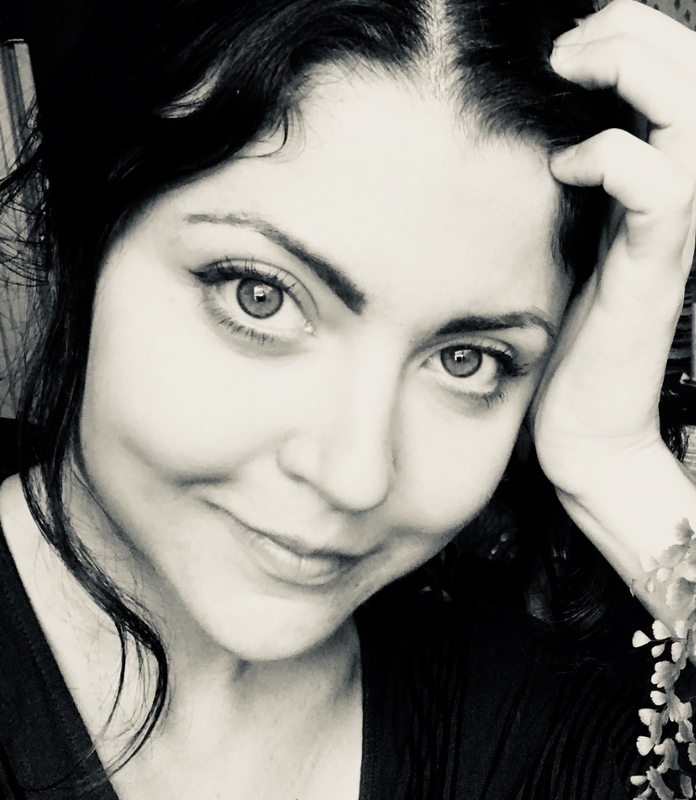 I lost my thyroid six years ago (when I was nineteen) to cancer. 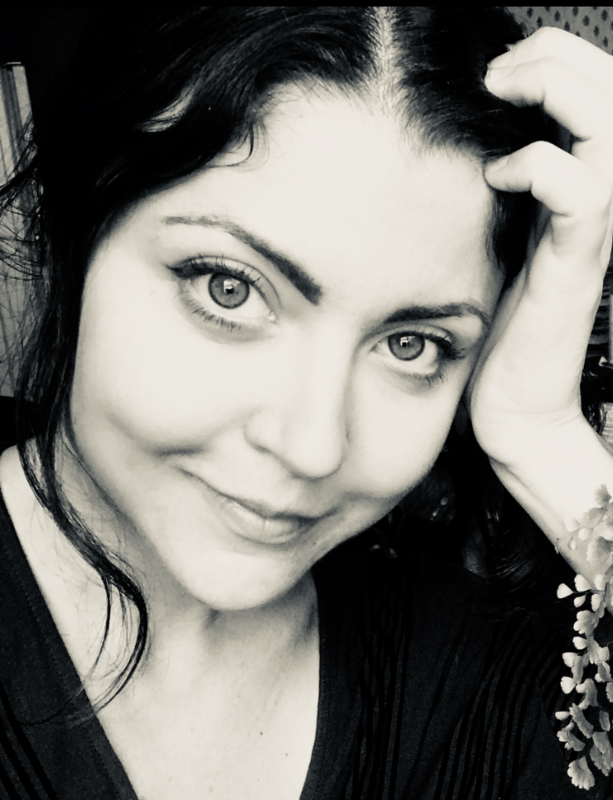 I’d already had Hashimoto’s Disease (an autoimmune thyroid disease) since I was thirteen. Needless to say, this makes life difficult. High-raw helps. Vegan helps (for me). Nothing makes me feel 100% though… though some purported “superfoods” do help too. Maca root is shown throughout the thyroid community (not just the raw community) as a helpful medicinal treatment of thyroid disease. Other “adaptogen” plants may also help people suffering autoimmune diseases that cannot be truly remedied by raw or anything else. I’ll probably never be 100% again given that I lack a very important metabolic organ, but I can try… and try, I do! I hadn’t been taking any maca for about a month and found that suddenly, I wanted it… badly. The body knows–as you know! So while I agree with you that many of the virtual raw food shelves are stocked with items that probably just cost the environment in global shipping costs, some of them are worthwhile for some people… and I do want to believe that certain raw food stores are truly trying to benefit the masses and not just fill their pockets! Love to you–and thanks again for keeping such an amazing blog. I was laughing out loud reading it last night! For some reason, I didn’t see your comments until today—my apologies! You raise an excellent point about herbs, and I should probably clarify my statement about powdered foods. I consider herbs and medicinal plants like maca in a different category than “powdered foods” (things like dehydrated green powders, raw meal replacements, wheat grass powder, cacao powder, blue corn powder, etc. ), the latter of which are just poor substitutes for fresh foods. Although I feel the ultimate goal should be to help the body regulate its own healing processes—without a life-long crutch on certain supplements or medicines—that isn’t possible 100% of the time, especially when body parts have been removed like in your case. Certain herbs can be tremendously beneficial in those circumstances. I’m glad you’re having success with maca root! i love this blog , its so… real (couldnt find a better word) , i can see that you are not dogmatic at all (as many people in the raw food lifestyle). im new to this , i learned about raw diet 6 months ago , and i have been trying to start, well… six months ago, but its very hard. i want to change my eating habits because my story is kind of simliar to yours( o my gosh , we are allergy mates!!) , always having problems related to health , mainly in my throat and digestion, if i go with a doctor right now, he or she will say that i have a strong infection in my throat, but the fact is that this has been my natural state 7/24 for many many years, well, as a child it was worst , i had high fevers too. Your aproach is great, first because the foods you recomend are easy to find almost anywhere, and not too expencive, many “superfoods” are just to difficult to find or to expensive to get on regular bases. 1 what is you opinion of organic food? im asking because here in mexico i get abundant fruit and greens at an acceptable price , but here the organic food culture is very poor, almost not existent, and i say almost because the very few places i can find are riduculously expencive. Considering that i plan to follow a diet similar to yours in the begining to see how it goes (im terrible at the kitchen , and your approach may work for me too) it would cost a lot to buy all those fruits and greens from an organic place. 2.1you mention that you eat yolk eggs, didnt you find them a little revolting in the beggining? 2.2 Ok, this may sound silly but i feel guilty dumping the rest to the garbage, what do you do with the white of the eggs? 3 you mention you dont eat avocados every day(i find them delicious) is there a particular reason for that? 1. Organic food: although eating a completely organic diet is ideal, it’s not feasible for many people—myself included. A good rule of thumb is to stick with foods where you discard the outer skin/peel, like pineapple, oranges, grapefruit, bananas, avocados, melons, mangos, papaya, kiwis, pomelos, etc. ; that way you’re avoiding the part of the food with the highest pesticide concentration. For non-organic fruits and vegetables where you do eat the outer layer, you can use a chemical-free produce wash, or soak your produce in a mixture of water, baking soda, vinegar, and grapefruit seed extract. I’m going to write about organics in my next blog entry (which I’ll probably post tomorrow), so check back for a lot more info. 2.2. Sometimes I toss out the egg whites, but other times I save them to make egg tempera (a type of paint) or to make home-made skin and hair treatments (they’re great as a face mask, or as part of shampoo!). 3. I feel best eating a fairly low-fat diet and getting most of my fat from eggs or fish, so I only eat small amounts of plant fats like avocado. Avos can be great when you’re transitioning, but if you’re attempting a high-fruit diet, eating a lot of fat can slow down your digestion and make it harder to handle the fruit. 4.1. Before eating a raw diet, I really hated exercising—but now it feels to easy and natural to move. As long as I eat enough to fuel my activities, my energy is through the roof. I lift weights, hike, mountain bike, trail run, do yoga and body-weight exercises, etc. and walk at least 2 hours a day (I don’t have a car). 4.2. It may sound like a lot, but I live a pretty active lifestyle and I need that much just to avoid losing weight. If I was sitting at a desk 8 hours a day and not exercising, I’d definitely need a lot less than that! Thanks for your questions Guille! I hope you’ll find the info in the blog useful. why is it that you dont eat egg whites? Interesting information. I agree with the approach that one’s diet doesn’t have to be a a constant battle. There may be some general guidelines beneficial to many, but the particulars for optimal health would be individual. There’s also the matter of personal preferences. 1. If you would consume 2000 kcal/day how much % should be or better said how much do you consume of protein, carbs and fat? 2. I read that you are eating a ton of spinach but what do you think about oxalic acid? 3. Are you eating your broccoli, cauliflower etc raw? (I’m not talking about juice!) When I am trying celery it tastes awful to me… but can somebody eat raw broccoli at all? 4. What do you think bloodtype diet ? Are you believing that certain food can aglutinate up your blood? 5. How much fruit or vegetables you recommend to eat? Is it bad to overeat with fruits or veggies? 6. You think that it is better to eat sweet and sour fruits seperate or it doesn’t really matter (sour apple and sweet strawberries for example)? 7. Do you eat your protein eggs etc. together with veggies or doing rather a mono diet with these things? 8. Do you recommend an eating window of 4-6 hours or you don’t care? 9. I’ve read that you don’t eat egg whites why? 10. What animal proteins do you eat and prefer, what amount per day? What type of fish you eat etc.? 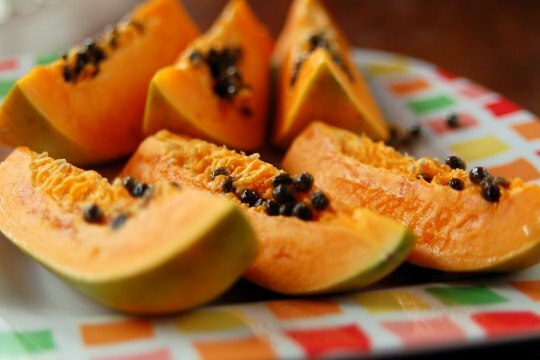 Your diet sounds similar to the Wai Diet, which is mostly fruits, raw fish and raw egg yolks. It can also include avocados and some olive oil. Btw, thanks for your blog, I love it. Have you experienced iodine deficiency? I read somewhere on your website that you do not eat dried fruit. Why not? You are one cute mama. I also tried being a low fat raw vegan and failed miserably after 4 months. Low testosterone, and though I had high energy I was always hungry all the time even after eating a ridiculous amount of fruit, like 8 bananas. Now I do better with mostly berries and apples, good amount of fat coconut oil, and raw butter and raw dairy. Some meat not too much lik3 2-3 times a week. And a lot of fermented and sprouted grains and veggies especially barley juice and lots of honey and herbs and medicinal mushrooms. It’s weird I do great on honey but not on fruit. Anyways gorgeous will You marry me? I will literally make your dreams come true. am in constant food battle, one because I love to eat clean and healthy ,,,two because i am very overweight and even with SURGERY! !have only lost 20 lbs in 3 years….no explanation from any medical persons for this. i exercise 4 days a week , almost 2 hrs per day..eat very little or no sugar, no white anything and am still frustrated. ive tried all raw, some raw mostly vegetarian….however, i still have no idea where to begin and what my body needs or doesn’t. however, your page reads so right to me…can you help at all? Forget raw, vegegtarian and what you call “healthy eating”, it’s mainly misguided. Eat nutrient rich and easy to digest, this means fatty animal food with offals, something all traditional people knew but was eradicated from us “so civilized” people. I’m at the end of 1 advanced human nutrition and metabolism on carbohydrates, lipids, and proteins, and 1 on vitamins and minerals, and from what I’ve been taught so far, cooking meats helps denature the proteins making them more available for absorption, as well as vitamins and minerals in properly cooked vegetables and eggs. While I hear from fans of raw foods that they are worried about the enzymes in raw foods being destroyed, What are your thoughts on the balance between making sure you are getting these enzymes and making sure that the proteins, vitamins, and minerals are optimally biologically available? If enzymes are the issue, where can I find information about these enzymes? Thanks in advance. Great diet. I just want to point out a couple of things. Cod liver oil has high vitamin D and high vitamin A which both compete in the body for the same receptors. May I suggest that you take your CLO and your D3 at very different times of the day in order to avoid the A pushing the D out of the way? Also, a question: Are you not worried about the high level of PCBs, Mercury, and other toxins in the seafood you eat (and possibly the CLO)? The USGS have come out with their surveys over the past 3 or so years consistently stating that ALL US waterways are contaminated and the seafood mined therein is not fit for regular consumption. Heck, I am even afraid to take Fish Oil and instead stick to Krill due to it being a much smaller animal, has a shorter live span and therefore less likely to accumulate toxins. Great work with the stats and studies!!! I share your concern about fish and fish oil contamination, not to mention that the stuff repeats on me and I don’t enjoy either the taste or texture of drinking it. However, I have found an AMAZING vegetarian source of Omega-3 & plant protein called “Sacha Inchi,” a nut that grows in Peru at the edge of the Amazon Jungle. The oil is cold pressed from the nut and it can be taken in gelcaps as well as used as a raw condiment (nutty, earthy flavor). The company I like is called Blamac and they are a small family owned farm who cultivate, press and distribute their oil themselves. Their website is blamacusa.com. Love this stuff! Wow -where do I start?? I could write several pages to you of my own experiences with raw foods. Bottom line – I love the practical, realistic approach you take to raw foods – especially that it is a journey that is to be explored on an individual basis. I went all vegan two years ago and got very sick. Trying to do 90 minutes of bikram and surviving on a vegan diet wasn’t cutting it for me. I was convinced meat was evil. Of course, it took me where I got very sick, tired and thin to finally start eating meat again. I never felt better! What I realized then is that what may work for someone else, may not work for me. Now my diet is very simiar to yours though I eat more meat. I also have a protein shake each morning that is whey based, cold pressed and grass fed along with two raw eggs. I have my green juice daily and don’t eat lots of veggies. I still do bikram daily and am stronger and happier now than ever. Isn’t that what we are all after anyway? To be happy and FEEL GOOD?!! Thanks for your wisdom! shoot….typo – meant I DO eats lot’s of veggies along with high quality animal protein. I came across your blog by chance today, and I couldn’t help writing this comment. I think you are harming your health with your current eating habits. Raw foods cannot supply you with what your body needs. You seem to be scientific about some things, and yet so subjective (almost impulse driven) about the way you decide what to eat. There is no credible science to support raw food diets of any kind as being adequate. Or you can prove me wrong by providing such evidence here. So far I don’t see it, despite your many blogs. I also think you are doing a disservice to your readers with this blog, and I hope you will realize this one day. You may want to discuss with your doctor and see whether there are some psychological/psychiatric issues that are “feeding” your raw food delusion (I am a physician myself, so I hope this will minimize somewhat the chance of you being offended by this suggestion). Thanks for the, well, concern! 🙂 I appreciate your comment and certainly won’t discard it. Raw food diets aren’t scientifically supported as being optimal (there’s a dearth of research on them in general) — and you’ll never hear me claiming, on this blog or elsewhere, that 100% raw foodism is the only way to be healthy. I don’t have any articles up giving scientific evidence for my eating style because I’m not interested in prosthelytizing (or even aggressively justifying) the way I eat. This is my n = 1 experiment, so far eight years in running, and compared to everything else I’ve tried, it’s what’s delivered me the kind of results I want. The only reason I talk about my own diet here at all is because I get lots of questions about it and want to be transparent about my lifestyle. Since I blog frequently about meat, dairy, fat, and other foods I feel are maligned, I want to be clear that I’m not writing about them because they form the bulk of my own diet and I want to rationalize my choices. Au contraire! Most of the current research regarding raw foodism looks only at raw veganism, not the diet I currently eat, and the pitfalls are similar to what’s found with standard unsupplemented veganism — usually elevated homocyseine from low B12, a few micronutrient deficiencies (zinc in particular), low vitamin D, and dental problems. In the case of raw veganism, maintaining a healthy weight can also be a problem because it’s difficult for many people to eat all the bulky plant matter necessary to get enough energy. I’m well aware of these dangers — the frequent failure to thrive with raw veganism is the very reason I started this blog — but the eating style I’ve listed in this post has circumvented those problems thus far. Again, over eight years at this point. If my health status ever declines I have no quibbles with going in a different direction, but I see no reason to when what I’m doing is working well for me. I’m not sure what would be missing from a raw omnivorous diet that would be available in a cooked omnivorous one. Can you name the specific nutrients you think would be lacking from a diet of fruit, vegetables, and animal foods? My weight is stable, so my energy intake is adequate; I’ve been sick only once in the past eight years; I have zero signs of malnourishment; I had a broken arm (from getting hit by a car) heal twice as fast as doctors were expecting; my health in general is very robust. I was a sickly kid growing up so this is a refreshing change for me. I don’t know how I’d be doing a disservice to my blog readers by eating a certain way. Again, you won’t find me advocating the specific diet I’ve chosen as being the best one for everyone; nor will you find me telling everyone to stop driving a car just because I don’t own one, or throw out their TV just because I don’t watch mine, etc. I live my life, and I blog about health topics. The two don’t need to completely overlap. @ Concerned: I am not Denise, but I take great offense at your comment regardless of how it was intended. As a medic, I would hope you would at least inform yourself before making such brash statements. As a physician, do you have any nutritional training? If so, you would be in a small minority- recently it was estimated that less than 5% of US doctors had training in nutrition. Those that receive some training in med schools (the handful that offer MD nutrition courses) do not even offer much. I find it incredibly presumptuous and uninformed that you would use phrases like “raw food delusion.” Check out Gabriel Cousens–a proper M.D. who has done some amazing work over the decades, who now supports raw HEALING. Perhaps you will label him unhinged because of his spiritual leanings, though. I almost attended medical school… until I realized I didn’t want to be a pharmaceutical patsy. Words like “delusion” seem more akin with the medical profession to me nowadays than people interested in natural diets. Also- “proper science” has a pretty hard time measuring anything that has multiple variables like diet–hence why pharmacology managed to boom–because it can produce single variable standards. Life, however, has multiple variables. By the way, I’m not even 100% raw–50-70% depending on the season. What doctors couldn’t cure, proper diet did. Sorry for the tone of this, but the comment just struck me has ridiculous–especially coming from a medic (but then I wasn’t surprised either). Followup: When I said, “As a medic” I meant as in you, Concerned, the medic. (Not me.) I, am, however, a medical ethicist. I didn’t intend to offend anybody w/ my comment, and if I did I apologize. But when somebody promotes eating habits that 1) don’t have scientific basis, 2) are likely to cause nutrient deficiencies, and 3) expose consumers to the risk of food poisoning (and in some cases death – see fatalities from E. coli 07:H157 caused by eating insufficiently cooked meat), I cannot keep my mouth shut. In regards to your observation about “multiple-variables” and diet study, that that hasn’t stopped researchers from performing a huge amount of studies looking at dietary habits and their impact on human health. 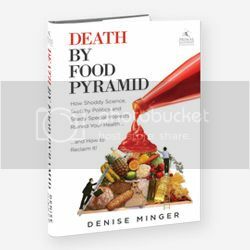 Problem is a lot of people are blind to studies that don’t get along well with their diet or philosophy; most just ignore what these studies say, and a few set about to criticize them – like Denise is doing here. Raw food diets of any kind are a fad, and they really don’t have good science behind them. Gabriel Cousens doesn’t stand even a superficial test of scientific integrity. What raw food studies have I criticized? Most of my study critiques are about foods I don’t eat and diets I don’t follow. My raw-food-related entries are generally quite critical of the “science” embraced by the raw food community, most of which I think is bogus (especially the enzyme theory). For the record, though, there are some benefits with scientific backing; they’re just mixed in with consistent issues with B12 and low energy intake (among other classic raw foodie problems). The bulk of the evidence points to improvements in rheumatoid arthritis and fibromyalgia, although in my hunch is that those improvements are related to the avoidance of certain foods rather than the raw-ness of the diet. I’m curious about the fatalities you refer to caused by E. coli 07:H157. Can you help me understand if they came from fish, meat, eggs, or vegetables? If fish, meat or eggs, do you know if they were wild or grass-fed or factory farmed fish/meat/eggs? If vegetables, do you know the source? I suspect it would be less wise to consume factory farmed fish or meat raw than it would be to consume pasture-raised (or wild caught) fish or meat, but that is just my intuition. I also couldn’t help but comment (again) on this thread – I am not a doctor, not a nutritionist, but what I am is a human who like others has experienced the profound (good and bad) effects that food can have on my body. It is my own responsiblity to treat my body with love including the foods I eat because ultimately, I will reap the rewards or suffer the consequences. What’s beautiful about our bodies is that they immediately tell us whether something is good or bad for us. I did fall into trying to be 75% raw food but honestly, I was misinformed at the time and was so determined to make myself feel good that I got sick if that make any sense. When I really started listening to my body’s signals and adjusting my diet accordingly, I began to feel great – almost immediately. I personally found that I am a strong protein type and NEED animal protein in my diet to survive and feel good. So my diet is a mix of raw foods and cooked foods including animal protein. But my own study is subjective and so is Denise’s but if you take the time to read her posts carefully, she never PUSHES her diet as one that everyone should follow. Her’s is also an experiment and through the years, she has found a balance on what works for her and she is simply sharing that. If anything, she is providing valuable info in that balance is important – not 100% raw, not 100% cooked. It’s about finding a healthy balance and what works for you. In the end, it’s really about finding peace and health with the food we eat. hi denise! thank you for this blog. i know nothing about statistics and am usually kind of number-phobic, but i find all of your posts accessible and engaging. i am dealing with health problems (at age 25) and often research different styles of eating that may provide relief. it is challenging to weed out the plethora of biased or just plain ridiculous information that is out there. after looking at the list of foods you eat, i’m very curious about what your meals actually look like. while i’m not requesting full blown recipes, could you just give me examples of what breakfast, lunch and dinner look like for you? thanks again for sharing your research and thoughts with the world! Denise, I’m wondering about the supplements you take, the cod liver oil, D3, and K2. Are there any certain brands that you’ve researched for the best quality? I’ve read about cod liver oil on the Weston A. Price website and they suggest many fermented brands, and also recommend Carlson’s (which by the way has quite a bit of vitamin D in it already, like 400 IU per teaspoon… would you take a separate D supplement in addition to what’s already in the cod liver oil?). Curious about the dosages on these supplements you take. Would you suggest I start with what’s on the label? Could you share what works for you? Thank you so much! I just checked out some of your posts. Great work I have to say. I am an aspiring health foodist….and I wanted to go all raw but dint really work for me either. You have a fun sense of writing which is refreshing to read. It is kind of annoying to read posts in which people always advocate something. So yeah, I like your take on getting the facts rite. Denise, could you share with us additional websites that you feel are leaning the right direction in regards to raw food and that share the sort of diet that you embrace. Are there any out there? I’m just wanting some more insight and I understand how you are hesitant to share details about what works for you. Maybe you could direct those of us who are interested and need to know more, or need to know how to go about doing your type of diet the “right way.” I’m currently eating paleo, and just within the past month drastically reduced carbs (cut out fruit, nuts, seeds, and tubers). It’s basically just meat and vegetables for me right now. What I’ve found is that I have hardly any energy. I don’t know if my body is trying to adjust to burning fat as fuel rather than carbs or what, but I’m not really liking this lethargic stupor I’m experiencing. I’ve been guinea-pig experimenting with my diet for years now too trying to find out what works best for me. Like you, I don’t want to just feel good, I want to feel awesome! I’ve been craving fruit lately. I love fruit and have missed it sorely! You mention that if you do lots of fruit, it’s best to do low fat as well. See, it’s stuff like that I’m needing more details on. Can you just share what you do- NOT recommend- just share? Or else point people to some resources? Thank you, thank you! @ concerned. What a horrible thing to say. Keep it to yourself next time. Anyone who openly accuses someone of that is well…. let’s just say, someone of questional character. Umm. . .safety concerns with parasites in raw fish (http://abcnews.go.com/Health/GlobalHealth/story?id=7847413&page=1), salmonella in eggs (http://www.ers.usda.gov/publications/foodreview/jan1997/jan97d.pdf), etc. Denise, this may seem like a silly question, but I’m curious as to how you got yourself to be able to eat raw organ meats, eggs and seafood. (Organ meats especially; I objectively know some of them can be healthy, but the thought of eating them at all, even cooked, gives me the heebie jeebies.) I’m sure part of my reservation is the fact that I ended an 8-year stint with veganism a few months ago, and I’m loathe to return to a highly-restricted diet once again, but at least part of the grossed out reaction would be there regardless, I think. OMG.. this post is about how I’ve have been trying to eat. But as a member of lfrv and primal site, being 2 opposing factionts, I can’t really talk to anyone about the middle ground. That is: my family with (husband and 2 year old), eat raw fruit based diet, with fish and seafood. BUT, we also eat meat. We still eat out, stil occassionally eat party food.. but all in all, its a raw fruit based diet. Its the best i’ve felt, and with a little of intermitted fasting when it happens naturally, my emotional eating issues are disappearing by themselves. I never thought I’d be able to say that! Let me clarify, we eat cooked meat. Just blew off a few hours of work reading your blog on my phone in some hidden hallway. Real interesting read. I have a few questions though. 1. how much sleep do you need on your diet? 2. how does your diet affect your hormones? 3. Do you know John Maus? The tremendous zeal for raw foods it the pendulum effect after so much bad food has been pressed upon us. In time knowledgeable people will find a happy medium. Hi, Denise! I’m so glad I found your blog. I was wondering what a typical day of meals would look like for you? Great blog, very candid and well researched. Refreshing to see someone cut though the BS and do the hard work of research and being unbiased. Question: where can I learn about eating like you do (raw foods, etc) and not die? In the snowy Midwest it’s sometimes hard to get real, fresh food. I came across your website by watching some videos on youtube of you. I am (eat) ‘primal’ (mark sisson) so I really love your stuff 😉 and the main thing to me: it makes sense. – I use Carlons cod liver oil. There is vitamin D3 in it. So no need to buy an additional supplement. I am going to check out the K2! Keep on your great work. Astonishing amount of information and the reply strings are equally engaging. I’m a surgeon in the UK and surrounded by junk food both at work and socially. I read The China Study whilst on holiday in Florida 4 years ago and it blew me away. Much to the astonishment and (it must be said) irritation of my family I insisted on immediately starting a vegan diet – understandably perhaps no-one elected to join me. ( Getting vegan food in Orlando and then the Keys is challenging to say the least). Nevertheless I persisted with it but despite rapid weight loss ( I was already a healthy weight give or take 3 pounds) I found I had several episodes of GI upsets. This was new to me and although the book suggests this will occur initially it continued to sporadically be a problem. The most recent event led to a vasovagal episode producing dental trauma and a scalp laceration from falling. At that point ( a month ago), I felt I’d gone far enough and am now clawing my way back to food reality. I’m using meat in my diet again but find it hard to find any justification for dairy ( including whey protein shakes) so that remains barred. Campbell’s work with its meticulously referenced claims appealed to my scientific nature and I can only assume that my increased lectin intake had something to do with my GI problems. I havent found any mention of lectins in his book. Saturated animal fats and the messages re cholesterol, atherosclerosis, and small vessel changes that are prevalent in the health media mean that even now I find it difficult to justify a full on conversion so I compensate with low-mecury-risk oily fish. I’m also loathe to try the raw fish/raw meat route, having seen the results of GI parasites and of E Coli infections from the ingestion of raw hamburger meat. Nevertheless I am a fan. Your website is factual, doesn’t claim to be the only way to live, and best of all avoids dogma. Now that I’ve found it I’ll continue to check it regularly. Thanks for all the work you’ve put into it. Hi, is that the largest to the smallest by measure of calories or volume? I follow a pretty close paleo regiment for my diet. I have been doing so for almost 3 years. I have not experimented too much with raw eggs… can you explain what it means to eat raw eggs? Anyway… cool post… I’m all for experimentation. I’m a vaguely-primal definitely-vegetarian scientist with a keen interest in nutrition. Thank you for separating what works for you from what might work for the “average” person (if there is such a thing). We’re all different and sometimes what could be a a good trend to follow just may not work for some people. I appreciate that good health advice will often be reasonably simplistic for it to stick in the minds of people who really aren’t that interested, but I’m also up for experimentation. Your n=1 experiment is fine with me! You said: “…Compared to a cooked diet based on the same foods, a raw diet offers more physical and mental benefits (…), “clearer eyes” (..)”. Why is this a positiver thing over dark eyes? Don’t get it. I believe she meant the white part of the eye being more white! Not to do with the actual color of the eye! Hi Denise, I’m curious to know is this still your current diet/WOE? I have been following you for a while. I am stumped at the moment about raw vs cooked, fat (how much), fruit (how much) etc. McDougall makes a fair case for eating starch (glucose) but then I feel kind of tired on all starch vs the high energy with more raw. 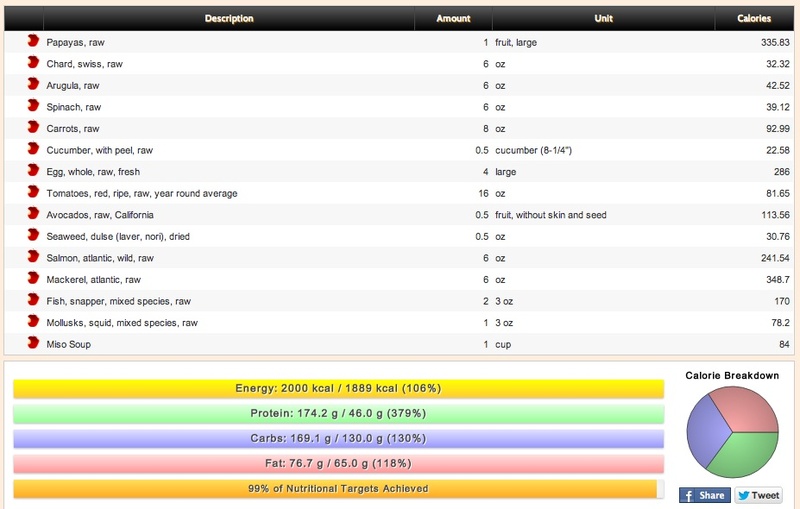 However I am scared of fructose now (Mercola and his <15g/day rule). I went the raw vegan route for 2 years and was able to lose weight and looked and felt the best I ever have in my life. However, after having hair/teeth/other issues, decided to add in some cooked starch. Eventually fell off the wagon altogether. Now I need to regain my health. 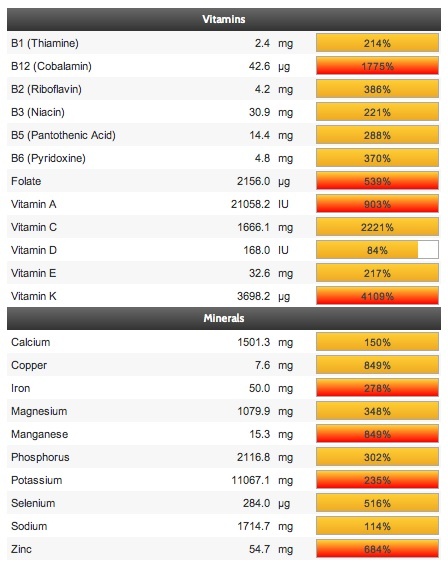 Do you feel raw is more important then ratios of macronutrients? ie: 80/10/10? I feel like when I started obsessing over ratios instead of just eating raw is when I got really confused about it all!! Do you have any recomendations for a female looking to lose weight, lives a typical schedule (work at a desk 8-5) and have the belly fat to show for it. I workout a bit after work and hike on weekends but am not nearly as active as it sounds you are. REALLY appreciate your advice 🙂 And yes I … we are all so very different. Incredible. I’m so glad to see other young people as interested in health & nutrition as I am, and I also love how you don’t follow any diet religiously, keep an open mind and research things on your own rather than blindly go by some advice a so called “health expert” gives you. As a 16 year old girl living in Australia, being interested in health/nutrition is socially disapproved of. Most of my friends gobble down Maccas, Subway & Wendy’s for lunch every chance they get, turn their noses up at anything that even slightly resembles a raw green vegetable, and habitually binge drink on the weekends to the point where they can’t even remember what they did the night before. I’ve had a keen interest in health for the past few years but because of all the controversial information there is available on nutrition, I’ve been struggling to find a sustainable, healthy diet that still allows me to have a speck of a social life. What do you usually eat when invited out to brunches/dinners and parties? Could you please estimate how many grams of protein you get per day? I, too, get most of my calories from fruit. I also eat lots of vegetables, and a few times a week, I eat fish. My doctor is warning me of protein malnutrition, and I was wondering what is your take on the protein hype? Would you say you consume 50 grams every day? Oh my Lord….I’m home!!!!!!!!!!!!!! I just came across your blog through Mark Sisson. My story is too long to tell, but suffice to say…I am you, but 40 years older! (That could be scary for you, Denise!) Recently, I have been SO lost in the babble of the “experts.” I can’t wait to read more your not-the-degreed-expert-but-it-works-for-me-stupid…blog! Where do you get your iron from if you don’t mind me asking. I see you eat shellfish 3x a week and liver/organs 2x a month or so, but that can’t supply you enough iron to function on, right? I mean I eat red meat and other animal meats daily, and I ended up anemic. Granted I was still eating dairy with it at the time, which apparently blocks iron absorption, but I would think I’d still have enough from all the meat I eat. Also, do you find your blood sugar gets unstable from all the fruit? If I eat more than a few pieces a day, I seem to get the shakes. Thanks for the comment! I just updated this page with some better info, and added some sample menus/nutrient breakdowns of what I eat in a day — some of the seafood, like oysters, supplies quite a bit of iron. 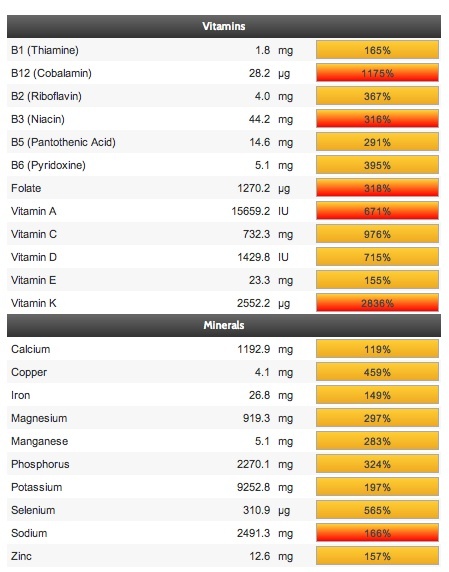 I developed anemia as a vegan, but haven’t had any iron issues since adding back some animal products. My blood sugar stays rock-steady as long as I eat fruit on an empty stomach (preferably in the morning, before eating anything else) and don’t combine it with fat or eat it after a heavy meal. I find fruit much, much easier to handle in the context of a generally lowish-fat diet, whereas adding fruit to a fat-based diet seems to cause more issues. That said, I think I have an abnormal capacity to handle high volumes of fruit without much issue, and I don’t expect that everyone else would share this experience. 🙂 Hope that helps! And I appreciate the eating fruit on an empty stomach tip because that may be my problem…I usually eat it with or after a meal. I will definitely give the empty stomach thing a try and see if that helps. But I love the daily food examples….I’m just so curious about your way of eating! Like I was wondering about how you eat raw veggies, and it looks like you mostly do salad raw veggies not those strange concoctions I see on a lot of a raw recipe websites or people that I see eating a whole head of broccoli raw….I just couldn’t do that. I can definitely do salads tho! That’s really interesting. When I was vegan, I found that eating fruit (especially in blended form) was, after awhile, giving me these huge blood sugar spikes where I’d crash before lunch and feel terrible most of the rest of the day. The worst was eating fruit for breakfast. It was always fine if I ate fruit with something else. I thought something was “wrong” with me because, hey, it’s fruit and it’s healthy! I’ve since come to realize that there’s a ton of sugar in fruit, and at least for me, it’s probably best not to overdo it. I find eating fruit with other food is much, much better. I also find my current, high fat diet has helped my body and my brain to feel much better than it has in a long time. As you and others have often said here–everyone is different. The new update is great, answers heaps of questions. Just one thing I wanted to ask, you said that the high fruit day and the sushi feast day were extremes. What would a regular day be like? Can you give us an example of a more usual day? Thank you so much, I love your articles! Your blog is amazing. I wish I’d found it earlier. I started eating raw in an effort to overcome severe, chronic constipation and bloating. Eating 80/10/10 was the closest I’ve ever come to relief, but it doesn’t help enough… and as I do more research I’m worried about nutritional deficiencies. Furthermore I’m trying to put some muscle on (I’m female, 5′ 5″, 115 lbs.) and have been having trouble doing that. I was raw vegan (mostly 80/10/10 style) from the age of 17 to 22. I’m 23 now, and have started adding in sashimi (doing well on it) and trying to add raw egg yolk (made me very queasy for a long time, I’ll keep working on it.) I’m also adding salt (unrefined) and fermented veggies back in, and I supplement b12 and d3. I think I’m really sensitive to starch and fiber, (even carrots and super-ripe bananas can mess with me, and flax seeds are a disaster.) My basic diet: vast green smoothie (fruit + greens) fresh dates, and more fruit or a salad w/ avocado or sashimi. My plan is to keep the majority of my calories from fruit, but add in generous amounts of raw seafood, and up the raw egg yolks. I’d like to try raw red meat, but I’m not sure how to do it safely. Hey Denise. drink more water and get some sea salt or Himalayan salt. that will help get rid of those acne u have! Hi Denise – What is the nutrition tracking program that you use (i.e., on this About page, the one you have screenshots of)? Thanks! P.S. Love your site! My body 100% agrees with your take on the capital-H-healthy benefits of raw + paleo. It’s wonderful to see the science articulated so well! Denise, I’m wondering how you prepare the bone broth and organ meats… Can you share your recipes please? What is that nutrition graph service you’re using? What is the point in using imperial measurements if the vitamin and mineral measurements are in metric? Talk about confusing. Hey Denise, Just went over your site. FASCINATING. Thanks for all the good work. 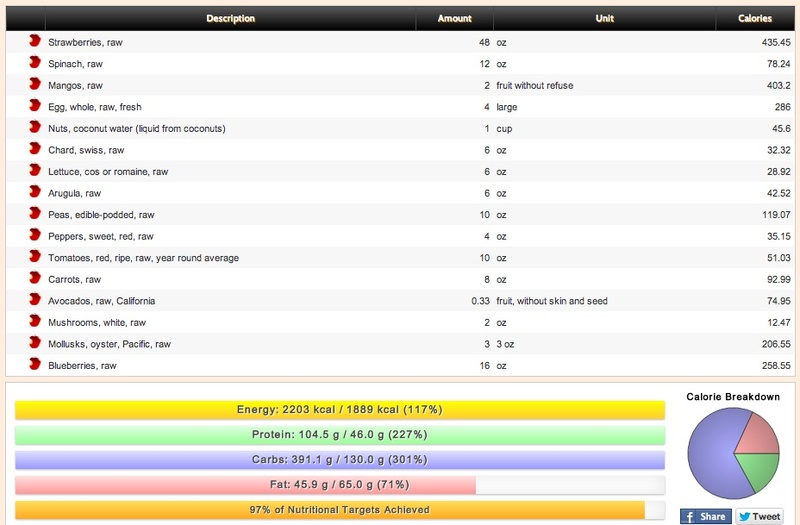 I especially love the ‘For Vegans’ page, as well as this one that gives us an idea of what your current diet is. I’ve experimented with vegan, raw vegan/superfoods, fruitarian, paleo, perfect health diet and primal/MDA (all STRICTLY) and it’s funny how I’ve ended up eating very similarly to what you put on this page. The Oysters, in particular, were VERY beneficial for getting my energy back. I ended up with big time Iron and b12 deficiencies (from doing massive heavy metal detox and also 100% raw for a long time) and was doing some searching on the internet and it led me to your site! I have a question if you get the chance to answer it…. I was wondering what your thoughts were on dairy? Do you consume it at all? I seem to do okay with small amounts of Raw grass-fed cheese and butter, but milk or any pasteurized dairy does NOT work for some reason. Gives me breathing problems. I’ve been doing the cheese for the k2 and calcium. @neisy, no disrespect but you remind me of bisexual girl that is simply confused. I wish I could fast forward and read this blog 25-35years from now and truly find out what choice of food you’ll be making then. I’m 99.8% sure different. For I have a feeling your going to flip-flop a few dozen times till then. No disrespect? Leave off the “no” and I can agree with you. (But just about the disrespect). This is a good read. I’m just not too sure about giving up everything yet because I do love eating. Veggies is not a problem as I eat that a lot but raw food is a big no for me. Hi there! I just wanted to say that I am SO darn happy that I found your site. I’ve been slowly dipping my toes into a higher-percentage raw diet and a lot of raw vegan sites have been helpful, BUT I’ve found them to also be one-sided and not very forgiving for those not 100 percent raw or vegan. I was wondering how do you eat your eggs raw? How do you know you won’t get sick from salmonella? Based on my experience, salmonella is a huge myth. Never had it, been eating raw meats for awhile. And if you do get it, you’ll be find with little pro-biotics until you feel better. Salmonella is not a threat to a healthy persons life. If you’d die from a cold, then salmonella would be dangerous. I also recall something stating that most people that die from “salmonella”, actually die from an allergic reaction caused by the anti-biotics or other medication they’re given, as the medical records usually state that they died from allergic reaction rather than food poisoning. Also, there was a study where 50 households were tested for salmonella and 38% of them had it all throughout the houses, yet the people were unaffected. didnt you say you developed 16 cavities on 80 10 10? why do you still eat so much fruit then? That’s a lot of seafood, have you ever had your Mercury Levels tested with a Provoked Urine Challenge? My first thought looking at your diet description is that it looks really expensive, especially the fresh fruit and fish fit to eat raw part. Would you be willing to say anything about the cost of your diet? Isn’t there vitamin D in Green pastures Cod liver oil? They say you should take butter oil with your clo, does your K2 supplement reglage that? Gosh, I generally feel bad for Americans not being able to discuss anything without going into extremes, so I think you’re on a right path here! However, I would like to mention that, sometimes, your writing teeters a little bit into the same territory of rhetoric that puts off a lot of people who are sometimes talked down upon by those who swear by whatever labeled diet they are on. I think it’s easier to provide objective information and let people decide for themselves without the sarcastic puns and other emotion-driven commentary. While passion for a subject is commendable, too much of it in writing may discredit your own point. Other than that – good luck on your book and stay healthy! Geez! Your writing and approach to all this is amazing. After reading and researching and experimenting for a long time now based on the more extreme ends of the spectrum, your blog really helps to give me a much better sense of direction. Please keep it up! I will be looking for the “donate” button or something. You are amazing. Thank you! What about Fukushima? Fish is highly contaminated these days. I am slowly reading your book, which is a little overwhelming for the average older person. One question, well, two. Do you supplement with K2 because there isn’t enough in High Vitamin Butter Oil – which comes in this nice blend with Cod Liver Oil? And two – you don’t mention fats and oils. Do you consume much coconut oil? Thanks! Denise, Ur blog.. Love it!! “Words of wisdom” as my Transilvanian nanna would say. Ah, ha. A Shaminet fan. Well, he is a scientist. The only thing I took away from his diet is the bone broth. I try to make it every week and throw my veg, beans, etc. into it. Not many cals in a broth and you get all the B vits., etc. of a meat-based diet. IDK, I agree with you. I like to experiment and have hit on what I think is right for me. I just feel so good when I follow the basic diet of Dr. Fuhrman. I do eat more protein, at times. I’m very low fat though. It just suits me better. Food is so subjective and it’s really important that people find what makes their psyche and their body feel and work its best. Exercise is my biggest problem. I need those carbs to do that. I tend to do a lot of it, when I do it, so some protein and carbs are absolutely necessary. If I just want to lose weight, I chuck the exercise and just follow Fuhrman until I’m at the weight I want to be. Then I up the cals. and exercise as I like. I’ve started consuming a lot of bone broth. How much do you think can be eaten beside it? Ever since I started eating cooked vegetables and meat again I’ve gained a lot of weight. Not sure it’s that much fat but all I know is I have a sensitive stomach and I want the bone broth to help fix this. Any advice on how much to eat? I was just curious about your opinion on cacao. Not the powder but pure, raw cacao. I’ve seen it in both brown and white. Is one the seeds and one the flesh/butter? What are you thoughts about consuming it? I hope this isn’t rude. I came across your website after trying to find scientific evidence to prove to myself that 80/10/10 (particularly the 30 bananas a day/rawtill4) approach was healthy. I was brought here and realized, okay, this seems right, as much as I wish it wasn’t (I hate the idea of eating animals, and love the idea of eating only fruit!). As I look at your intake, I can’t help but wonder about your calories. It seems you don’t eat many calories! Me, I could easily eat 3000 calories every day. Does this have to do with maybe your body doesn’t need as many “calories” as the average person because you’re eating food high in nutrients? Just a question I’m not sure even you have the answer to! Thanks for writing, and being brave enough to think critically. I am amazed at your findings/writing/truths. Why no roots like sweet potatoes? I love your blog, I appreciate all this information in one place! I tried a high raw diet for about 4 months and it completely destroyed my libido; however my skin was clear, I was at an ideal weight, and I had abundant energy for everything else! I like your take on hybrid meat and raw- but I’m wondering if you’re concerned about the high levels of radioactivity in seafood and seaweed since Fukushima? Studies have already shown presence if radioactive isotopes in pacific salmon and seaweed, and it’s likely that the plant will continue to leak for years. The mainstream media will continue to downplay its impact in human and environmental health, so it’s hard to know the real risk. Have you researched this? I’ve started consuming a lot of bone broth in the hopes that it’ll help my stomach issues. Do you have any advice concerning how much to eat of bone broth and what to eat beside it? I don’t know how many calories are in it. And how about lead toxicity? Denise, I see you responded to an earlier comment where someone was surprised by how much you ate. To me, it seems very little! I’m surprised with the amount of activity you do that 2000 calories will sustain you. Is it because you’re eating more greens than a typical raw foodist? I find myself very hungry eating this amount of cooked food, let alone raw food. Especially after much conditioning done by other raw food gurus/leaders, etc. about how you need to eat X amount of calories to sustain yourself on such a diet, and admittedly, this has also been my experience with raw. The spiritual practice I practice, Falun Dafa, teaches that is is pretty awful for people to eat live animal flesh of any kind (be it fish or meat), because through cooking the soul of the animal leaves from each cell, but when eaten raw, it stay and remains in the human body as it is a small universe. Because it can’t exit and reincarnate, it starts to hate the person and it cause gastric problems, stomach ulcer or cancer. So never eat raw flesh. 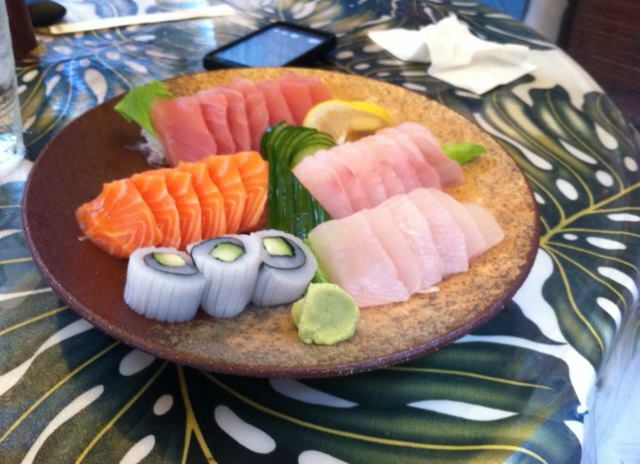 Sushimi is not a cultural cuisine, it is a modern invention. People in the past always cooked fish. Having seen the little section of your 23andme genetic genie methylation profile, your diet makes perfect sense…for you. With the homozygous MTHFR C667T mutation, you it would make sense that you would feel better on lots of raw vegetarian food, because food folate is abundant in raw leafy greens and many other raw food and vegetables. Cooking destroys almost all of the folate in food. Plus with both an MTR and MTRR mutation, your need for B12 might also be higher. Thus the need to have some animal food in your diet. Total veganism simply would not supply any B12 and eventually your body let you know that, and you succumbed to the salmon sushi. The ultimate problem with epidemiological studies is that they cannot ever show what works best for the individual due to the fact that we are all similar but biochemically different. Not that epidemiological studies cannot be useful, but they do have limitations. I understand that you have to have affiliate links in your blog, such as Amazon affiliate to k2. But since you mentioned getting majority vitamins minerals from food source, why then you simply get k2 from food sources such as natto and other foods high in k2? I myself am not a scientist but always bouncing back and forth between the “science” proving the raw food diet and the “science” proving the paleo/ ketogenic diet… I find it all extremely confusing slash frustrating. Can this be updated it was posted in 2010 how is her diet now in 2016? It was edited at Feb 2015, as is written in the article. I urge you to switch to a plant based diet involving zero animal products. I say this bc in 30 years you’ll still be alive but the oceans will not so you are and everyone else are eating themselves out of house and home. Also consuming all that mercury from seafood is anything but healthy. Why do you think there is a limit on the amount of fish consumed per week? I don’t see that for broccoli. The facts are that Animal Ag is destroying this planet and is unsustainable. You claim to read a lot so please read about that. You have an obligation to all the ppl that follow you and steer them in the right direction. I absolutely loved your interview with Dr. Mercola. Kudos for your brilliant mind and ability to synthesize diverse information. I have been a researcher and biohacker my whole adult life, due to clustered, complex issues that compromised my full thriving. I keep adapting and changing as I tune to the higher intelligence of my body. Your approach is sane, flexible and builds a greater knowledge base as you explore. I too believe that we will probably never have all that answers, especially any that will be true for all people. Thank you! Thank you! Thank you! I will be following you for updates on your discoveries.